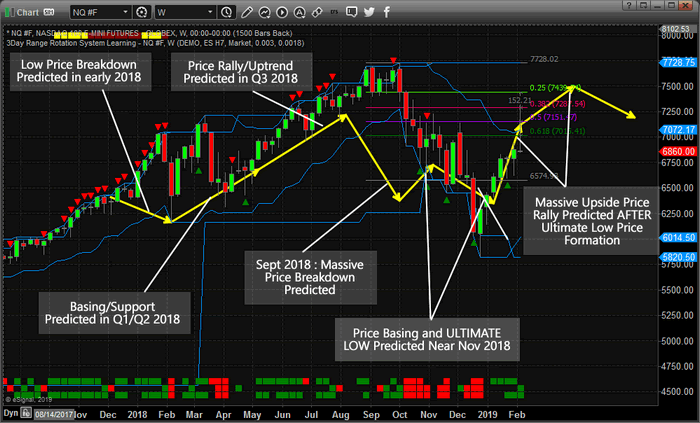 If you missed PART 1 (SP500 Price Forecast) be sure to read it here. Here is PART II let’s take a look at the NQ Weekly chart with the ADL predictive price modeling. We are going to include predictions made by our Adaptive Dynamic Learning (ADL) price modeling system that originated from December 2017 going all the way forward through to the end of May 2019. At this point, we are going to highlight our earlier predictions (all of 2018 and into Q1/Q2 of 2019) and show you what the market has done since these calls were made back in September 2018. Pay attention to this weekly chart and pay attention to the YELLOW ARROWS on this chart. We have highlighted key predictive price modeling points with these yellow arrows on the chart to show you what our ADL predictive modeling system suggested would happen back in December 2017. Now, take a look at the NQ Weekly chart with the ADL predictive price modeling results displayed onto it. Pay attention to the similarities in the price patterns and the rotational modeling differences between the two charts. The ES ADL modeling predictions from “Part I” are similar to this NQ chart, but the differences really tell us about how the technology-heavy NASDAQ (NQ) will react in a different manner than the Blue-Chip heavy ES. Also, pay attention to the right side of this chart where the ADL predictive modeling system is suggesting price weakness will roll into the NQ near May 2018 and how this may become an issue for some traders. Remember, the differences between these two charts really show you where strengths and weakness apply to the different sectors of the US stock market. One sector may be trending upward while another sector may see weakness. All of this plays into how we find and see opportunities for our members and decide on trading opportunities for success. It is not too often that we share this level of research with the general public. We issued the September 2018 research post because we wanted to warn our followers that a massive price decline/rotation was about to unfold. You can read all of our free research posts. Today, we are sharing with you our ADL predictive price modeling results for the next 3~4 months for the NQ – how valuable is that? If you save or print this article, you will be able to reference it going forward for the next 90+ days and compare the real price action to our ADL predictive modeling results. We believe the results will be similar to what our ADL is suggesting and we can see these ADL results for any instrument traded throughout the world.